Cut the asparagus into strips, then steam for 3 to 5 minutes. Meanwhile, cook the pasta and cut the ham into thin strips. 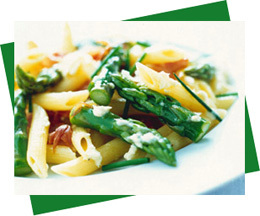 When ready, drain the pasta and add the Crème fraîche, horseradish, asparagus and ham. Season with salt and pepper, sprinkle with chopped chives and serve hot. * Crème Fraîche (French for "fresh cream") is a heavy cream slightly soured with bacterial culture, but not as sour or as thick as sour cream. Originally a French product, today it is available throughout Europe and the U.S.